A look at the best Spain PNR actions from the first round of FIBA World Cup qualifying and how teams defended them. This coming NBA season, heralded international coach Sergio Scariolo will start his NBA career as an Assistant for Nick Nurse’s Toronto Raptors. His influence on the NBA however, was felt long before taking this position…. This season will also see the first European-born Head Coach in the NBA, Serbian Igor Kokoškov of the Phoenix Suns. Italian legend Ettore Messina has long been a trusted Spurs Assistant Coach for Gregg Popovich, and with Fotis Katsikaris beginning as an Assistant on Quin Snyder’s already Euro-heavy Utah Jazz staff, the international NBA tactical osmosis is in full flow. Maybe the most quintessential representation of this international infusion, is the prevalence of an action called “Spain Pick and Roll,” an action named after Scariolo’s Spanish national team that frequently ran the set during the 2016 Olympic Games. In truth, the history of this action (like most plays and actions) is much harder to trace. Simon Jatsch found an example of coach Zelijko Obradovic using it with Panathiniakos in 2002. That example in itself, was unlikely to be the first time anybody set a back screen for the roller, and Scariolo uses the action with such success and with so many adaptations, that it seems fair for the name “Spain Pick and Roll” (Spain PNR) to live on. 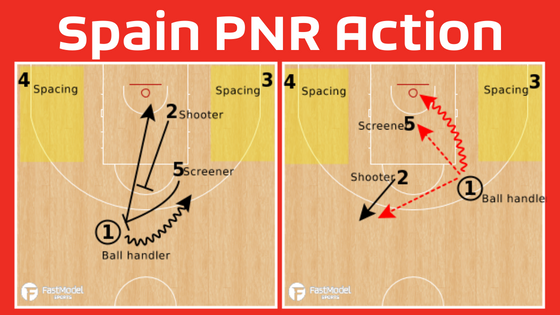 Spain PNR action is best separated into three roles; the ball handler, the screener and the shooter. Three-man actions with two players spacing, actually form the basis of a significant number of modern basketball’s most devastating actions. Spain PNR is difficult to defend in general, but in international basketball when teams are without the benefit of playing together all season and often have less chemistry on the defensive end, it’s especially devastating. Here’s the basic alignment and action, although it can be adjusted and run with numerous different variations and lineups. For the reasons stated above, it was no surprise to see teams utilizing a wide variety of different Spain PNR sets during the FIBA World Cup Qualifiers in July. The following are my favorites, along with some of the different ways to defend them and the subsequent offensive reads. Click on a play to download it to your FastDraw library. 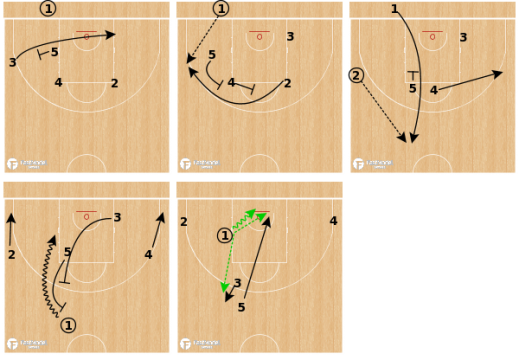 On the surface, this is a very simple entry into Spain PNR by Germany coach Henrik Rödl. A simple “Iverson Cut” is run across the FT Line before 5 sets the ball screen to enter the Spain PNR action. The key thing to notice for execution is the angle that the shooter takes on the pop: not straight up, more of a diagonal. Also notice that it’s a 4 in the shooter role rather than a 2. Serbia, coached by the excellent Sašo Djordjević, were attempting to use this coverage shown in first video above. Germany negates the switch by putting 6’10” Robin Benzing in the shooter’s role. Stefan Peno, who was defending the ball handler and is 6’6″ still isn’t going to have much impact on the release of his shot. It’s also worth noting that Peno can’t leave the ball handler until he knows the shooter’s man has switched. The error in communication and timing meant that by the time Peno was recovering to Benzing, the ball was already out of his hands – a perfect example of how Spain PNR can be so lethal against international teams, with less time together. Just to hit the point home, watch Germany run the same play again with Benzing in the shooter role. Again, the communication and coverage breaks down between Peno and Steven Jelovac defending the shooter. Peno is late recovering and gives up a cheap foul on the pump fake. The frustration between Peno and Jelovac is visible. 2. The way Germany used this set was very difficult to predict because they ran a variety of different actions out of the same Iverson cut. This was Germany’s go-to set in the game and they got what they wanted every time. In this option, Germany masks it with a pin down and have Benzing making the Iverson cut. This time Benzing sets a “Veer” screen and catches it with an open lane ahead of him. Boban Marjanović is defending the screener’s man and has no chance to close out on the switch. Serbia, to their credit, made every effort to adjust their coverage to stop Germany getting what they wanted from this set. The clip below is early 4th Quarter. This time it’s Boban defending the screener, and he drops and hedges until the ball handler’s man can get over the screen and recover – no switches. The shooter’s man now has to gamble on how long he stays home to cover the screener’s man before recovering. In the first example he waits too long and Maxi Kleber nails the shot. Next, Serbia gets (almost) everything right and recovers to a neutral advantage situation. Fortunately for Germany, they have an NBA playmaker in Dennis Schröder, who catches his man taking a breath and creates an advantage by himself. Game over! The master at work here, as Scariolo’s Spain runs Spain PNR from side and baseline out of bounds. First up is the BLOB, where a crafty back screen and staggered screen is used to inbound the ball. Then the ball handler makes a “Gut Cut” up the lane, via a down screen to catch the ball. This set works really well because the Spain PNR action starts as soon as the ball handler catches the ball. It’s extremely difficult for the ball handler’s defender to fight up through the down screen and then get over the top on the Spain PNR. The other thing to notice is that Montenegro are using the same coverage that Serbia tried in the last clip. They drop the screener’s man back and the shooter’s man plays jeopardy on the timing. Next up is the SLOB. Zipper cut, into DHO, into Spain PNR – beautiful basketball. The first thing to notice on the execution is the spacing. Quino Colom playing the ball handler role, uses almost the entire depth of the half court. Then notice the hesitation, spin and cross he uses to shake his defender and get the timing right. Coverage-wise it’s the same from Montenegro, but watch Colom read the shooter’s defender to throw the lob pass. The help is late and Spain nearly get the dunk and 1! With Scariolo at the helm, Spain have taken their namesake action to different levels, especially against this type of coverage. Watch another clip of their BLOB. This time the shooter’s man is preoccupied with the screener’s man (after he caught a lob last time). Javier Beirán in the shooter role, realizes that his man is wary of the lob, so instead of popping for the shot, he rolls into the space for the easy 2. The ball handler declining the first screen is also key here. Same BLOB again and now Spain are using the full repertoire against Montenegro. This time the screener’s man drops too far and Xavi Rabaseda in the shooter role turns and sets a *down screen on the screener’s man instead. Montenegro go under the ball screen, forcing Spain to re-screen. They get the mid range jumper for Fran Vázquez anyway. He misses, but the defense is so scrambled it leads to an offensive rebound and wide open 3! *possible moving screen. A case of delayed gratification here, as I’ve saved my personal favorite for last! Spain are on the receiving end this time, as Eurobasket champions Slovenia give them a taste of their own medicine. The absence of Igor Kokoskov, retired Goran Dragic and an NBA focused Luka Doncic, has made qualifying for the #FIBAWC an even more challenging proposition for Slovenia. But Head Coach Radovan Trifunović still has them playing the same trademark basketball and it’s so pleasing on the eye. 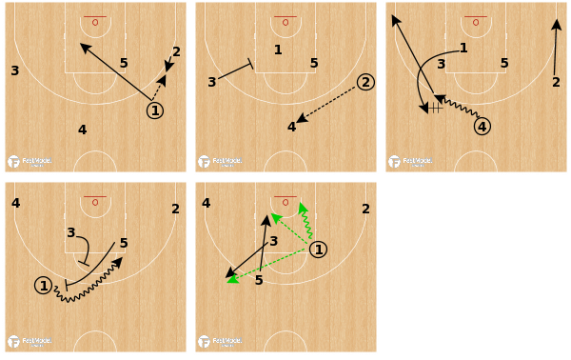 Slovenia start this set with a similar entry to Spurs’ famed “Motion Weak.” The PG hits ahead to the wing and cuts through to the weak side, then receives the ball back on the reversal. 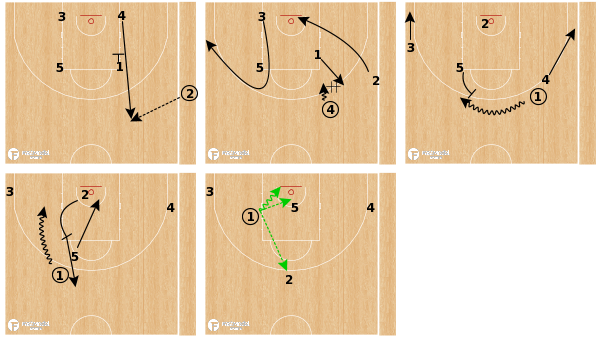 Slovenia add in “Chicago Action” or down screen into DHO, BEFORE getting into Spain PNR. Everything flows like a hydropower plant and Slovenia ping the ball around to transfer advantage until they get the shot they want. This set is destructive enough on its own, but what Slovenia did so well was to not overuse it. It would be tempting to go to this every time down but if your opponents’ shortened preparation time is already working in your favour, it’s a much more useful ace to keep up your sleeve. Aside from having a lineup that can switch 1-5 and knows each other well enough to not blow any switches, it doesn’t really matter which coverage you try with this set. Executed at this tempo, the defense is going to make a mistake somewhere along the line. Follow Diccon on Twitter @DLScoaching and visit his page on the FMS PlayBank for more great XsOs! Head Coach for @BasketballWales U23 NT Men Assistant Coach for @BasketballWales NT Senior men Head Coach @BasketballEngland South Region U15 Boys Basketball Coach @rocketsreading I also produce Data & Video Analysis, editorial content for the FIBA Basketball Champions League @BasketballCL and Lecture Sport in the Further Education Sector. I am always looking to share ideas and thoughts on Basketball Techniques, Tactics and Coaching Practice across all sports. Great analysis.. I just want to one adding; The inventor of this action is “George Karl” who showed this action around 1990 on a coaching DVD!